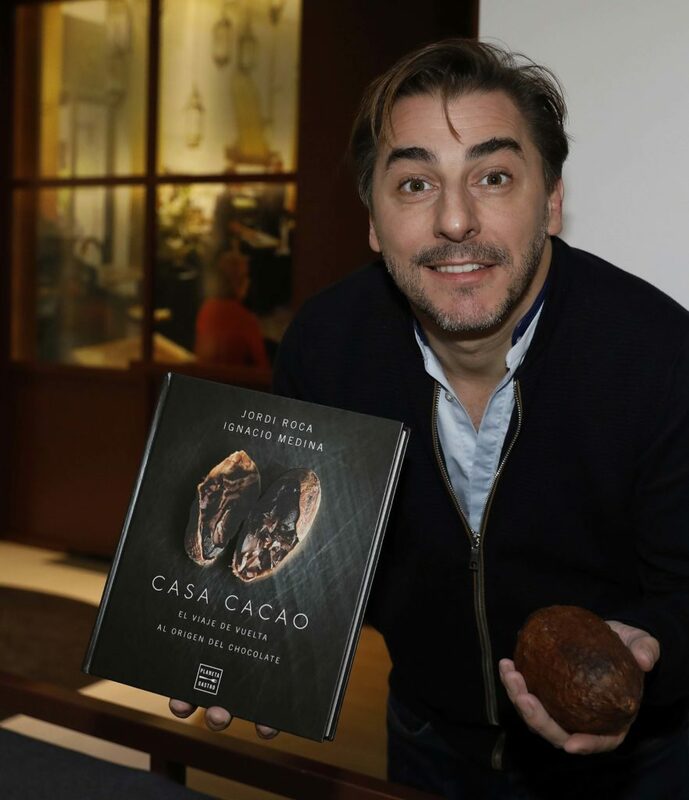 Pastry chef Jordi Roca introduced his new book ‘Casa Cacao’ (‘Cocoa House’), a cookbook full of creations where chocolate plays the leading role. Co-authored with food journalist Ignacio Medina, this cookbook is also an encyclopedic dedication to cocoa and follows both men on their journey through various parts of Latin America in search of the best chocolate in the world. 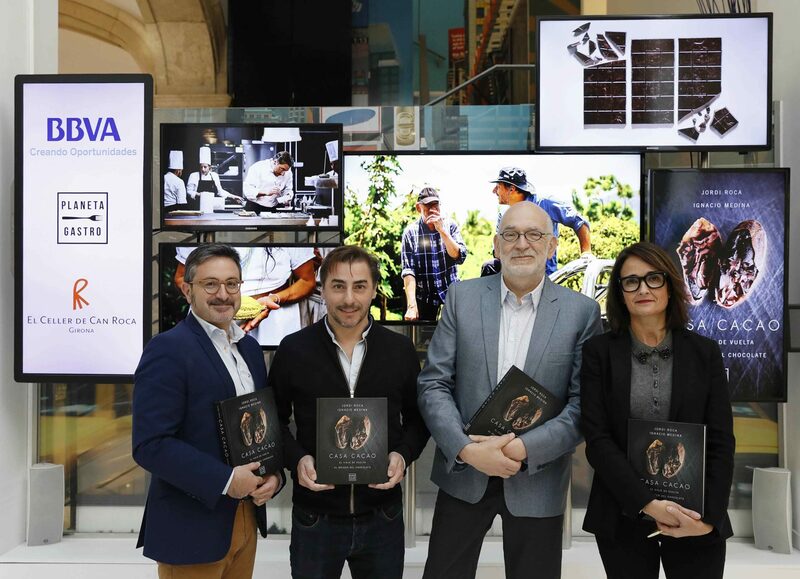 The launch of the book in Madrid included participation from Oscar Moya, BBVA’s Director of Global Sponsorships and Corporate Content, and Lydia Diaz, Director of Planeta Gastro, a Spanish publishing house specializing in gastronomy. This book is a prelude to a gastronomic venue that Jordi Roca will open next year in Girona, in northeastern Spain. BBVA will produce a documentary to accompany the kick-off of the new venue. Last year Jordi Roca and Ignacio Medina embarked on a journey to several Latin American countries to study cocoa in all its forms. The pastry chef of El Celler de Can Roca and the food journalist toured Colombia, Peru, and Ecuador to visit small local producers with interesting projects and unique stories. Jordi’s idea consisted of establishing relationships with many of these local growers in order to supply cocoa to Girona’s soon-to-open locale dedicated to chocolate. “’Casa Cacao’ deals with the need to understand cocoa in order to understand chocolate,” Ignacio Medina explained during the book launching. For Jordi Roca, the whole creative process acted as a springboard causing him revisit what he thought he knew about his vocation: “I knew how to work with chocolate, but this trip has been a profound education and important for my profession.” Jordi and Ignacio recounted some of the lessons they learned: “In the areas where cocoa was traditionally consumed, it was brewed. It was roasted, ground, turned into milk chocolate. Indeed, It’s considered to be a treat for children,” Medina explained. “It is a book that is much deeper than cocoa, behind the chocolate there are real-life stories,” Medina commented. One of these stories is about Colombian farmer, Exelino Sierra, who – with the support of the BBVA Microfinance Foundation – was able to transform his cocoa crops into full-scale plantations, thus escaping drug trafficking and its associated violence. 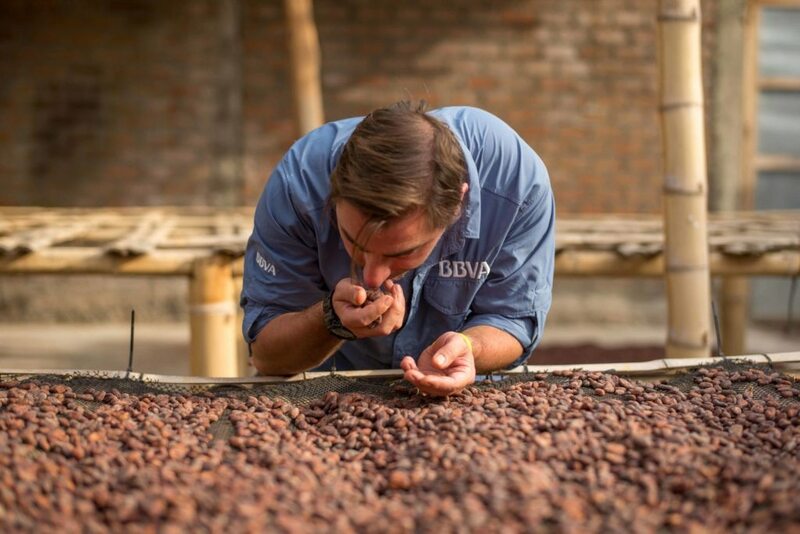 During their trip to Peru, Jordi and Ignacio met Óscar Velásquez, another customer of BBVA’s Foundation, who is rescuing native cocoa varieties, crops that are much more sustainable than the rice fields he previously tended. The book, published by Planeta Gastro in collaboration with BBVA, is now on sale in Spain and will soon be available in Peru and Colombia. Rocambolesc, Jordi Roca’s ice-cream parlor chain, with locations in Madrid, Barcelona, Girona and Alicante, is gearing up for the summer season with the Icephone, a new popsicle that aims to round off an already fantastic menu. The youngest of the Roca brothers presented this smartphone-shaped creation as a tribute to the BBVA app, which was recognized as the world’s best in 2017, and recently renewed the same distinction at European level.